Rescue workers assist people who were injured when a car drove through a group of counter protestors at the "Unite the Right" rally Charlottesville, Virginia, Aug. 12, 2017. The U.S. Justice Department has opened a civil rights investigation into the car ramming that killed one person during a protest against a white nationalist demonstration in Charlottesville, Virginia. Attorney General Jeff Sessions, the country's top law enforcement official, said, "The violence and deaths in Charlottesville strike at the heart of American law and justice." Sessions said," When such actions arise from racial bigotry and hatred, they betray our core values and cannot be tolerated." Virginia' Governor Terry McAuliffe declared a state of emergency after fights broke out between armor-clad, shield-carrying white nationalist demonstrators gathered to protest the removal of a Confederate statue and similarly armed counter-protesters in Charlottesville. "I have a message to all the white supremacists and the Nazis who came into Charlottesville today. Our message is plain and simple: Go home," McAuliffe said at a news conference. "You are not wanted in this great commonwealth. Shame on you." "The acts and rhetoric in Charlottesville over past 24 hours are unacceptable and must stop. A right to speech is not a right to violence," he tweeted. President Donald Trump, speaking Saturday in New Jersey, condemned "the egregious display of hatred, bigotry and violence on many sides" in Charlottesville. He called for a "swift restoration of law and order" in the city, adding "no citizen should ever fear for their safety and security." Shortly after the rally was canceled Saturday in Charlottesville, a car rammed into people in a street as they were leaving a counter-protest. Video showed bodies flying in the air. A 32-year-old woman was killed and about two dozen other people were injured. 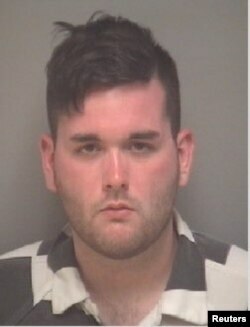 James Alex Fields Jr. is seen in a mugshot released by Charlottesville, Virginia, police department. Police said they had the driver of the car in custody. They identified him as James Alex Fields Jr., 20, of Ohio. Hours later, Virginia state police said one of their helicopters had crashed in a wooded area outside the city, killing two troopers. The helicopter was being used to help law enforcement monitor the rally. The incident involving the car occurred as people were leaving the area after police deemed the demonstration unlawful; multiple bouts of violence had broken out between the white supremacist demonstrators and counter-protesters. Hundreds from both sides were involved in Saturday's violence, throwing punches as well as water bottles and other items. Police used tear gas to separate participants. The gathering, dubbed the “Unite the Right” rally, had previously prompted McAuliffe to warn people to stay away from the area during demonstrations that began Friday. In what they called a "pro-white" demonstration, torch-bearing white nationalists marched through the University of Virginia campus and gathered around the statue of General Robert E. Lee, a Confederate Civil War hero. They shouted epithets and slogans such as "white lives matter," a take on the grass-roots organization Black Lives Matter, which was created after several killings of black Americans by police officers. The city voted in April to remove the statue, a move being taken by many U.S. cities against such Confederate memorials. Since then, the city has been a focus of white nationalists. One demonstrator at Saturday's protest, who did not give his name, told VOA, "We want to keep the statue because we think that it is an important symbol of our heritage and our people. It is meaningful. Its meaning is implicitly connected to white people ... in preserving our heritage and preserving the white race, our white heroes. Robert E. Lee is one of those heroes." Kasey Landrum, however, from the counter protest group, told VOA, "I am here because white nationalists, white supremacists, Nazis, whatever you call them, they are the same thing. They represent the structures of evil, which in this case is white supremacy and that is an assault on all of us ... Unless we stand up against that ... they are going to continue to harm us all." Trump was criticized by members of both political parties for not specifying white nationalists in his comments about the violence in Charlottesville. "We should call evil by its name. My brother didn't give his life fighting Hitler for Nazi ideas to go unchallenged here at home. - OGH'' Senator Orrin Hatch, a Republican from Utah, said on Twitter. "@POTUS needs to speak out against the poisonous resurgence of white supremacy. There are not 'many sides' here, just right and wrong,'' Representative Adam Schiff, a Democrat from California, said on Twitter. Among the white supremacists at Saturday's rally were alt-right leader Richard Spencer and former Ku Klux Klan leader David Duke. Anush Avetisyan contributed to this report.